Fall in love with cooking again with access to live cookalong videos! Easy to follow recipe videos packed with top tips! My promise to you is to keep it simple. Ingredients, preparation and timing is key, taking your home menu to the next level with my 45 years of cookery experience. I have shared my vision with over 500,000 people from around the world how to enjoy a stress-free cooking process. I have also been asked every imaginable question and now it’s time for me to share this in my online library with you. I want to teach you how to cook restaurant style food with your ingredients, in your home, guiding you with tips, tricks and how to flavour dishes. So get ready, we’ll be going on a journey, on my online, Ann’s Smart School of Cookery. Ann Hood, owner of Ann's Smart School of Cookery and past contestant of BBC Masterchef, (January 2009) started the cookery school in Essex, due to her passion for cooking. In the ten years it has been operating it has grown from strength to strength, offering cookery adventures for everyone. 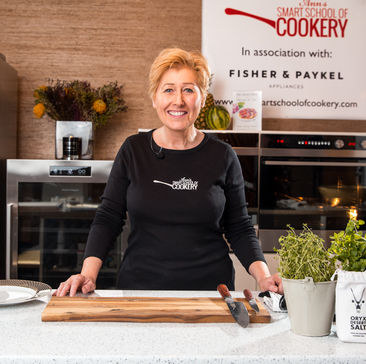 Ann's Smart School of Cookery is an intimate dining and learning experience, where you can gain insider tips and tricks of the trade from Ann as well as specialist celebrity, professional and Smart School trained chefs, in an informal and relaxed atmosphere for up to 20 guests per class. The ingredients used are fresh, local and delicious, the tuition is professional and down to earth, and the completed dishes, sublime. With a huge regular following who visit us time and time again learning something new every time. You are sure to have an enjoyable and informative time, where you will first discuss the menu ahead and be provided with an apron and after the course you'll receive the recipes by email. Chef will invite a small group at a time to prepare, cook and serve your chosen menu to ensure everybody has a 100% all round experience. Hot beverages are available for purchase on the day.